Initially, I had no plans to buy this lens but could not resist the temptation when I saw it at a bargain price in a very good condition at a used camera gear online marketplace. I actually looked for a 165mm F2.8 lens, which could be a good supplement to my 90mm F2.8, but decided to first try 135mm F4 Macro. Unfortunately, and, oddly enough, very few technical details can be found about this lens, except for the well-known facts which you can read on the relevant page of PentaxForums.com. Nevertheless, some information regarding its optical implementation can be traced. It is an implementation of Voigtländer semi-symmetrical Dynar lens formula — modification of Heliar lens which is also a variant of the Cooke triplet design. The Pentax lens is very close to the F3.5 Dynar that was previously renamed Heliar. The Dynar is an ancestor to all modern Heliars. Actually, this isn’t a macro lens. It’s developed specifically for close focusing. At the maximum lens extension of 42mm it gives only 0.31× magnification ratio with exposure factor about ×1.72. To achieve 1× magnification the lens should be extended by additional 93mm with full set of extension tubes #1+2+3. As a result, you get a very long lens with exposure factor ×4 which is equal to the actual lens speed F8. This results in focusing screen becoming very dark and makes the actual focusing very difficult. The focal length of a 135mm lens with the field of view 36.5° is close to that of the old 150mm F2.8 lens with a field of view 33°. Well, I like to use it for close portraits, as for such image scale there is no need in extension tubes. It is a portable, lightweight and very handy lens despite its size comparable to 165mm F2.8 lens but 200g lighter. The lens has a deeply recessed front element, so it doesn’t actually need a hood. But in certain situations it still may be required. Original clip-on plastic hood PH-SA 67mm costs around $50. A cheap compact metal round hood for $3 can be a good substitute. It has a 67mm filter thread which works fine with both screw-in and special bayonet mount filters. 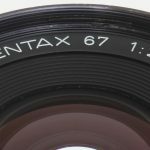 The lens has 8 aperture blades, which is typical for most of the Pentax 67 lenses. I rarely stop it down below F16, so I will show several photographs of aperture opening up to this value. The lens is very sharp throughout the entire aperture range. The key reason for this has to do with its nearly symmetrical design, thanks to the Heliar optical formula. It helps to almost completely eliminate lateral color, coma, and distortion. And there is one more bonus – it has a very pleasant “Heliar-style” bokeh effect and is sharp even when wide open. I like to use it for closeup portraits. Well, it is a close focusing lens designed to focus closer than normal lenses, sharp and lightweight with the focal length between standard and portrait lenses. So, it is more convenient for me than a classic portrait focal length, as I do not like to stand too far away from a model when shooting close-ups and use extension tubes. In my opinion, it is an underrated lens in the Pentax 67 lineup of lenses. Thanks for reading! Interesting?! Scroll down to the "Leave a reply" section, say "Hi" and share your thoughts about it. Your opinion is very important for me. Do you have your own experience on using Pentax 67 camera, lenses or accessories? Let me know about it! I will include this information in further posts. Great lens with incredible sharpness even at non macro distances! Are you still using the lens? I’m considering to add it to my 45 and 105 at the moment. The 105 at times feels a bit to short so I was looking for either the 135 or 165. The 135 is tempting as it lets me get closer, the 165 however I suppose feels more like a classical 85mm KB portrait lens. Both tempting – which one do you prefer to shoot? d) the hood is better for 135mm. As for standard lenses — I’ve both, 90mm and 105mm. The first is very versatile lens. So, having 45mm it is better to keep 90mm instead 105mm. Also you will have gap about 17 deg between 90mm and 135mm instead of 9.5 deg for 105mm to 135mm jump. It is more convenent configuration 45mm — 90mm — 135mm. But you are right about classic 85mm lens on 35mm format. But you should use the lens that features your style of photography rather than to comply with the tenets. Thank you for the message, Ken! Have a great portrait shots with P67! First I want to thank you for the very complete information about everything pentax 67. It really helped me a lot choosing my set-up. But my question is if you know what the red and white markings on the barrel mean? Thanks in advance. Thank you Jan! I’m really like to help you. White markings on the top of the lens means magnification scale, because it’s still a macro lens. So, if you focused on something and get number 15 by this scale it means that the subject will be 1/15 = 0.667× of original size. As you may note the maximum maginfication is 1/3.2 = 0.313×. To get the life-size enlargement this lens requires whole set of extension tubes (#1+2+3). Which red markings did you mean? I’ve used red colour to point attention to the certain characteristics. Thank you for the comment. Typically, there is no much difference between “S-M-C Takumar” and “SMC Pentax” lenses of the same focal length. There are some oldest Super-Taukmars with older lens coating. All of them were manufactured in 1969-1971. There are some “S-M-C Takumar” and “SMC Pentax” lenses of the same focal length but optically different. For example, S-M-C Takumar 6X7 200mm F4 and SMP Pentax 67 200mm F4 are completely different. Both of 75mm F4.5 are the same lenses with different finishing. I prefer latest edition lenses. They have a slightly better lens coating on my opinion. But there are two 55mm F4, “Pentax-6X7” and “Pentax 67” engraved. They are completely different two and have no Takumar predecessor. In another hand, Takumar 6X7 F90 2.8 and Pentax 67 90 F2.8 is not the same lens. Usually, the difference is only in lens coating. Super-Takumars are single coated lenses, Super-Multi-Coated Takumar, SMC Pentax-6X7 and SMC Pentax 67 are multi-coated lenses. Also, on later lenses, multi-coating were slightly improved. Only for some lenses, the optical formula was changed. It is Pentax-6X7 55mm F4 and Pentax 67 55mm F4, Takumar 6X7 200mm F4 and Pentax 67 200mm F4. As for Takumar 6X7 90mm F2.8 with a leaf shutter, it was replaced by completely different Pentax 67 90mm F2.8 with no shutter inside. There is another lens may be found with different aperture unit — 67 300mm F4 which may have 7 or 9 blades inside. Well…wow, I am absolutely amazed and excited! It is absolutely wonderful, that someone like you exists, who use this legendary mid-format camera, who is apparently ready with spending time by creating these very (in modern ages) useful pages. 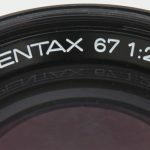 I own one Pentax ASAHI 6×7 as well and your blog/this article helped me right now to buy 135/f4 Macro lens. Well thank you and keep performing, you have absolutely wonderful photos.. respect! Thank you, Marian! It is my pleasure to share the experience with people who love (and enjoy I hope) Asahi Pentax 6X7/67 system. The new articles will come soon. Большое спасибо, Саша! Искала в гугле примеры фотографий для 150 mm f/2.8, в итоге нашла ваш блог и поняла, что если мне что-то и нужно дополнительно к 105 мм, то это 135 мм, а не 150-165. Очень информативно и полезно. Ольга, не за что! Очень рад, что статья оказалась полезной! This article (and other on 165, 105 and 90) helped me to choose my portrait lens! 135 is also way cheaper than 105! Thanks for reading! As for now, 135mm is my favorite lens for close portraits. I bought it from eBay without lens hood quite cheaply. How much is lens hood needed? Can you share your experience? I would buy it later eventually… What is the original lens for this hood by the way? I found that people use plastic PH-SA 67. Is it the same shape as the original? PH-SA 67 is the original clip-on hood for 135mm F4 Macro and for 150mm F2.8. It is also possible to use this hood with 105mm F2.4 without darkening the corners and even with soft focus 120mm F3.5 via 77->67 step-down adapter ring. Also, I recommend buying a cheap metal round hood for telephoto lenses which is a quite good choice for value. Pentax 67 135mm F4 Macro lens already has a deeply recessed front element and actually, it does need a hood only in certain lighting conditions, for instance when you place a light source just near the lens for macro work and others. Also, you can find on eBay old Takumar 6X7 135mm F4 Macro metal hood. As far as I know, it is available both with screw-mount and bayonet-mount. The 135mm F4 Macro accepts any of them. I prefer PH-SA 67mm in a studio or home and the metal round hood for outdoor shooting because it has a more compact size. I wonder whether your lens has some cloudiness. There is some in my lens, but very little, so I think it should not be a big issue. I guess that lenses with really clean optics are those more expensive, but you never know in advance, if you buy online. The 135mm F4 Macro is one of the cheapest lenses in the system. Anyway, buying lens on eBay is a lottery. You need to watch for this cloudiness, will it grow or not. I will treat it by UV. I do not think it will grow. And I plan to open some lenses to clean either the front or the back element. I would also like to know how much you stop it down because the scale looks pretty tight. Can I get a good portrait when fully-open? The middle format is a totally different animal, so I will need to get used to it. Anyone using on Sony bodies? I had 645 120mm F4 Macro about 10 years ago. Are you talking about vignetting at wide-open aperture? It’s a good true macro lens but without a “character” on my taste, unlike 67 135mm F4 Macro. But it a lens only with close focus capability, not a macro lens. I used it both on Pentax 645 camera and Canon EOS 5D, but only just for testing. It’s quite strange I think to put a lens giving 55x70mm image size on the 24x36mm sensor. I may be wrong of course. Anyway, to get the 1:1 ratio you will need to get a full set of extension tubes.